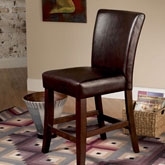 This 24" seat height sleek contemporary bar stool features a heavy duty hardwood frame with tapered legs with tight seat. Soft-top grain bi-cast leather and a distressed aged mahogany finish complete this classic look. Some assembly required. Bar furniture is constructed of long-lasting solid hard wood frame. Features: Chair features high-quality brown bi-cast leather upholstery Rich, warm cherry finish on legs feature a comfortable curved back design Stools provides both comfort and durability.